Let me tell you a story. I worked for an organisation that provided consultancy services as well as IT services. My team consisted of 8 people. Two consultants and six non-consultants. Every time a decision was made inputs were taken from everyone on the team. The quality of suggestions that came from each of the team member was similar. Thus I believe that value addition and quality are measurable and that they depend on depend on people’s knowledge about a subject, not the domain they come from. Your domain might aid you to utilise previous knowledge but that alone does not suffice. Thus we agree that “Although investment banking and consulting draw the best minds among MBAs, these services add very limited value to the real economy”. The mad rush behind Consulting and Investment Banking in any B-School is quite understandable. 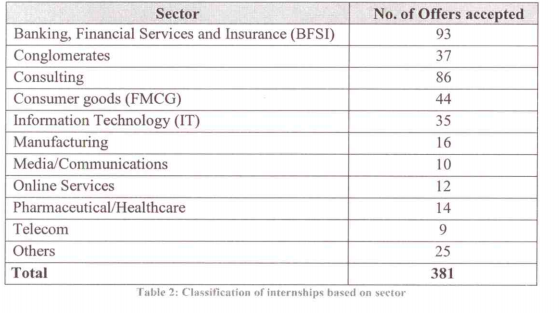 A glimpse at the placement statistics of one of the most reputed management institutes in 2013 proves the same. Consultants and Investment bankers definitely aid in the growth of the Indian economy in terms of improving the quality of decision making. But are they the only ones that do? Are MBA grads the only people that define the economic growth parameters viz the GDP or more importantly, the real per capita GDP? And even among these, those who entered these specific fields account only for 47% of the total number (extrapolated data from table, Assumption 2). On comparison with the total number of employed people working in the country, does this number point to any sizeable parameter for comparison? India has more number of engineers and non-engineers who do not even pursue a management degree. Consultants usually work at level three and the majority of the work force within the country work at levels beneath those. Measure the economy in terms of the wages that these people earn and in turn contribute to expenses and thereby the whole demand-supply cycle. Value addition to economy happens when you are able to sustain the employment of your people. Services is a fragile part that cannot exist for a long time without the proportionate growth in the manufacturing sector. Manufacturing sector growth needs the services of operational, and general management MBA’s more than consultants or IB’s. The real value add to the economy for the future is poised to come from the non-consulting and non IB MBA’s. When does the economy prosper? The economy consists of multiple sectors. Growth of these sectors along with other economic parameters aids in development of the economy. Among these sectors a small percentage is occupied by the corporates and other institutions. A small percentage of the working percentage in these are handled by management graduates and an even smaller percentage of that number by consultants and investment bankers until of course we aren’t looking at just consultancies or IB firms. Let’s look at retail banking that caters to the mass population in the country. Now even within banking how many employees are really management finance graduates? The best example is the State bank of India, even the MD, who sits on the topmost chair, Arundati Bhattachraya herself does not have an MBA degree. The bank that stands by the policy of being “the banker to every Indian” itself does not advocate the necessity of an MBA graduate. Do you realise the sample size that we would be looking at eventually if we consider IB’s and consultants? And finally consultants do not consult other consultants do they? Investment bankers do not propose solutions to the same clan, do they? Eventually you are looking at providing solutions to clients who belong to neither category and in either case the ratio of the solution provider to the solution taker is very minimal. Sectors that provide for the growth of the Indian economy such as agriculture, services etc do not employ too many consultants or IB’s. Even Tata Consultancy services, the largest non-government sector employer in the country, although a consulting services firm, minly employs engineers to work for them. The crux of the matter is the fact that no matter what sample you consider, say for example just within a single city like Bangalore the number of consultants and investment Bankers would not be able to match the rest of the working population. The working population eventually caters to the growth of the economic indicators, starting from the demand supply chain up until the Gross Domestic products growth. Many decision makers in the MNC’s might be consultants or Investment Bankers but those who implement those decisions, those who are the majority in most cases are not from the same cadre. Value addition in an economy as large as ours has to happen across mass numbers if it has to create the perceived impact. Just by catering to a niche segment one certainly cannot influence the entire economy. This might just be one of those instances where Pareto’s law fails! How curious -or is it ironic?- that you’d choose to use the very same city that lent its name to the term “Bangalored”. Which, in it’s very definition refers to low value jobs being transferred to cheaper destinations, in this case Bangalore. While these teeming masses indeed contribute to the consumption, that’s not saying a lot, is it? Any human being, in their inherent nature of survival will contribute to consumption. To imply that by simply outnumbering IBs or Consultants, they might “cater” more to the growth of economic indicators sounds just a bit sketchy to us. “The bank that stands by the policy of being “the banker to every Indian” itself does not advocate the necessity of an MBA graduate. Do you realise the sample size that we would be looking at eventually if we consider IB’s and consultants?” Why the assumption that only MBAs end up as IBs or consultants? The article revolves around the fact that non-MBAs often add more value than MBAs, but in my opinion, that doesn’t make any justice to the topic. 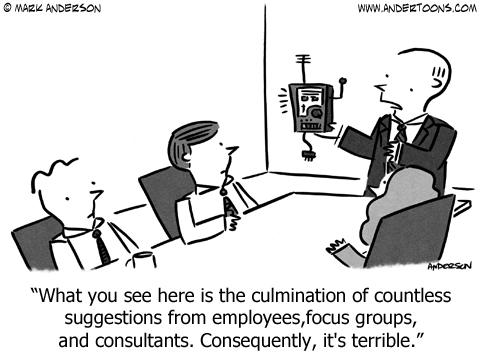 The business of consultants thrives on the inability of companies to find a sustainable solution to their problems. The sample size of IBs and consultants may be less, but that is what makes value added per consultant very high. And using smaller sample size as an indicator of less value addition hardly makes any sense. I believe the discussion here is not about whether non-MBA or MBA IBs /consultants add more value to the economy. Talking about adding value to the economy, the IBs help in the listing of firms from various sectors, help them in raising capital, in undergoing M&A et al. The contribution of Private investments to the GDP of India is around 23% (2012). How much of this capital is being invested with the help of IBs? Measuring the direct contribution of IBs and consultants to the economy doesn’t do justice to their contribution. What about the indirect contribution? How many firms were saved from making bad decisions or even bankruptcy by IBs and consultants? This isn’t easy to estimate. Firstly, yes we are trying to look at the impact that IB’s or consultants can add to the economy by gauging the impact of the magnitude. We agree that consultants and IB’s help the economy to grow.All we are are saying is that in a population of approximately 1.3 billion, what could the MAGNITUDE of the impact of these Consultants and IB’s be? Consider the US sub-prime crisis, the consequent impact on the economy and the subsequent Euro zone crisis.Whose decision mattered here? IB’s have actually exploited and underestimated the capability of the “invisible hand” of the market. How many good decisions can counter this one single bad decision and to what extent?